Is Another FEC Complaint On The Way Against Charlie Crist And The FDP? Did The FDP Breach Bill Clinton Security? Just when I thought I would be able to write something positive about The Florida Democratic Party Leaders, they, along with Charlie Crist, show why this divide within the party is growing wider, and growing stronger. As you all know, the FDP’s Leadership Blue Gala happened last night at The Westin Diplomat. Democrats from far and wide came together to celebrate this dinner, and to listen to President Bill Clinton give a speech. President Clinton was a bit hoarse, but, as usual, he didn’t disappoint. Bill Clinton is like a Rock Star! Getting back to the shenanigans that occurred at the dinner. The dinner consisted of what looked like some form of chicken, although I haven’t quite figured out what it was, my guess was gecko, or what that sauce was that was on it, cous cous, and vegetables. The $225.00 ticket fee clearly wasn’t predominantly for the meal! On a smaller plate by every meal was a fortune cookie. The fortune inside the cookie read: “Charlie Crist is in your future”. Really? Another slap in the face towards Nan Rich. I asked Scott Arceneaux, Executive Director of the Florida Democratic Party, about the fortune cookies. He denied having had any knowledge of, anything to do with, or having the cookies placed at every person’s plate. In fact, he asked me why I thought he would have anything to do with doing something like that. I’m going to give you a few minutes to gather yourselves, because you should be laughing and rolling your eyes like me. You mean to tell me that the leaders of the Florida Democratic Party, at a dinner that includes President Bill Clinton and plenty of Secret Service, didn’t know what was going to be on each and every table in that joint? If this is correct, then President Clinton, or any other President or Presidential Candidate, should NEVER come to speak at a FDP dinner because anyone is able to place anything on the tables without their knowledge. 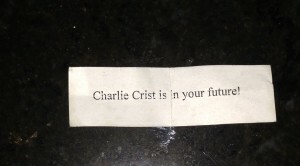 Yes it was tacky fortune cookies promoting tacky Charlie Crist, but God only knows what else it could have been! Now let’s talk about the FEC complaint that should, and probably will be, filed. First, the cookies were definitely not in line with what is required by Florida’s FEC. According to the rules, even if campaign advertising isn’t authorized by the candidate, and I’m not saying it wasn’t authorized by Charlie Crist, along with the Florida Democratic Party, that needs to be investigated by Florida’s FEC, it is still REQUIRED to have a disclaimer, which this did not. “Paid electioneering communication paid for by (name and address of person paying for the communication)” (Section 106.1439, F.S. ), should have been somewhere on that tacky fortune cookie, and it was not. Again, does Scott Arceneaux and Allison Tant expect us to believe that they have no idea how unknown cookies managed to make their way onto every plate on every table at a dinner featuring President Bill Clinton? I should really forward this to the Secret Service and let them in on the investigation as well. In addition to this being a breach of campaign laws, if in fact the Florida Democratic Party didn’t know, it was a breach of security as well. An unknown person placed unknown objects at every table where President Bill Clinton was speaking. I can’t emphasize that enough, so I will say it again. If the Florida Democratic Party had nothing to do with it, they should come out and condemn it, AND try to figure out why security was breached that allowed unknown items to be placed on every plate on every table where President Bill Clinton was speaking. This is why I say a complaint should be, and probably will be, filed. Something in the milk here isn’t clean, and this deserves looking into. Not only by Florida FEC, but President Bill Clinton’s Secret Service detail. I would think the leaders of the party would want to find out what happened, unless they were in on it to begin with. Charlie Crist is bringing this party down. Being blinded by warranted hatred of Rick Scott is causing some to turn a blind eye to legality, security, and party principles. If you really think about it, that fortune cookie message is somewhat creepy. What I found particularly galling about Crist’s appearance at LeadBlue was his announcing to the media and fellow Dem attendees that he was in Nantucket picking up a $500k check from the DGA – what a slap in Rich’s face, rude, disrespectful, sort of like a school yard kid telling everyone “the teacher likes me ’cause she gave me her apple”. If I had to guess Charlie timed his appearance to be purposefully late, knowing the press would be waiting for him, hoping to ride the crest of the rising chatter of “where’s charlie?”. It appears you didn’t read the entire state statute. FS 106.143(8) states the the disclaimer requirement doesn’t apply to novelty items having a retail value of $10 or less which support, but do not oppose, a candidate or issue. I’m pretty sure the total cost of those fortune cookies wasn’t $10.00 or less. In fact, I’m quite sure the cost of all of those cookies was far more than 10.00. Let’s let the FEC determine that, though. Anything else you want to say? Stacy, now at least we know who created them. Your actions and those of your cohorts are in direct violation of your oath as a Broward County Commissioner if not legally, at least morally, a characteristic that you are clearly unfamiliar with. As a lawyer you have skirted many of the FEC rules and have been charged with as many as 28 violations in the past and even was found guilty on at least one occasion to the tune of over $8300. The fortune cookies were indeed in violation and I hope you are fined again. Are you really giving advice now? Stacy Ritter please tell me about how the Neutral Florida Democratic Party was involved in this unethical breach of campaigning.